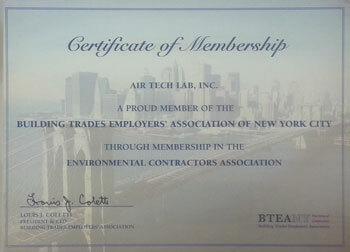 Air Tech is a 30 year old environmental company. We offer a complete range of environmental and Hazmat remedial services. We have excellent reputation and can provide long list of references. We performed thousands of Asbestos Abatement, Lead Removal, PCB Lighting Fixtures, Mold remediation and Hazmat cleanup, and after Fire and Flood cleanup. Our clients vary from airports, private and public schools, government buildings, broadway theaters, high rise commercial and residential buildings, and private high end residential. Call us now for a free estimate, let us come in and give you a price, you have nothing to lose. You will be happy you did.